Here’s my best effort to make La Femme happy. I learned from Pauline and Evolution that it’s really hard (at least for me) to wring a truly beautiful smile out of face rigging. I hope these will tide you over until somebody comes out with superb morph expressions. Cheers. @robzhena I got the free base figure and bought the 'Carrie' morph for her. There is a wide smile morph included in the face morphs that come with La Femme. If you aren't seeing any face morphs look in the Pose library for the face and body morph injections. Tempesta3D's Foxy for La Femme, Blackhearted lights for Superfly, Amethyst Ghostship Hair Shader on Delphia Hair for G3 converted to prop hair using DUF Tools from D3D. Should be Lulu hair on Angel image. Available on my site, or - eventually - in Rosity's Free Stuff. Almost done with the suit. I dig the portrait lighting, and the good rim lighting to accent her figure. Nice job! @johndoe641 Thanks, johndoe! Yeah, that's her default body shape and head, but with Tempesta3D's Roxy textures. I also made La Femme fit morphs for some of my PE clothes. 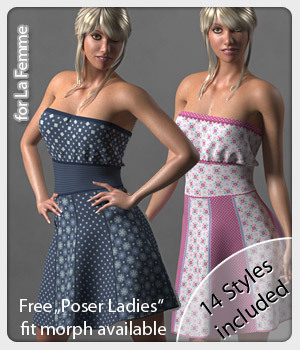 They are all available at my Renderosity freestuff. Live at Rendo: Muscle Me for La Femme! @f_verbaas Nice. One question though . . . I picked up the Prefitter in August 2017, when you had it at Content Paradise, and I was wondering. Have you updated it at all since you brought it to Renderosity? @miss-b I updated the Promo material and renamed because Rendo does not support 'versions' for a product. The LaFemme plugin is fully compatible with the version I had at CP. Behaviour may be slightly different though. I have the impression that the CopyMorphsFrom function in Poser was updated or tuned and range of influence is reduced. Originally it had trouble doing boots and shoes because of cross effect between left and right. That is gone now with the latest update. @fverbaas Ahhh good to know. I know Renderosity has been asking CP vendors to redo their promos, so the fact you did, doesn't surprise. Live at Rendo: La Femme Comic Book Expressions. This is a set of expressions for La Femme that resides in the face library. I crafted all the expressions using the face control handles. Applying morphs to La Femme moves the face handles, and sometimes you may wish to zero the morph, apply the expression, and dial the morph back in. If the morph doesn’t displace the affected face handles very far, directly applying the expression works fine. I'm sorry I missed a couple of thumbnails where I forgot to turn off handle visibility when I created the fc file.These are essentially the same expressions as my set for Evolution, though there is now a hard-to-locate morph for pucker, so I ditched that. I wonder if there will be EZSkin support forthcoming for her?